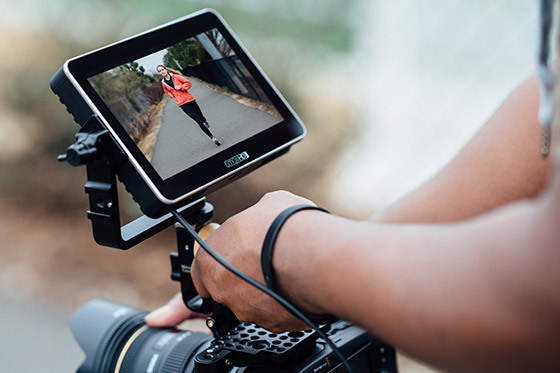 For all you independent filmmakers and small production teams out there SmallHD have just launched the Focus 7. This is a new 7” touchscreen monitor that comes with an affordable price tag and lots of great features. Unfortunately this low cost results in a few compromises, such as no SDI input and only one HDMI input and no output. However the Focus 7 still has lots going for it including the 1920x1200 resolution/323 pixels per inch/1000 nits bright display that can handle 4K signals up to 30p. A SD card slot for unloading 3D LUTs, monitor profiles, and screen overlays plus a 3.5mm headphone socket for audio monitoring. To mount the FOCUS 7 onto a camera or gimbal there is a 7-inch Tilt Arm which is sold separately and available in the Gimbal Accessory Pack. It has two integrated Sony L Series battery slots which are hot swappable and via the 3.5mm barrel output you can power a small DSLR or mirrorless camera. So all in all a great new addition to Small HD’s current line-up providing a tremendous value for money daylight viewable display.